(New Haven, Conn. – September 25, 2017) – A project designed by Pickard Chilton, a highly-regarded architecture studio best known for its award-winning designs of corporate headquarters and campuses, has received approval from the City Plan Commission to move forward with 3001 Turtle Creek, a 17-story, 350,000-square-foot multi-tenant office tower in Dallas, Texas. Pickard Chilton was selected by Hillwood Urban, a Dallas-based commercial real estate developer led by Ross Perot, Jr., as the Design Architect for the building. Principal Jon Pickard of Pickard Chilton made the announcement. 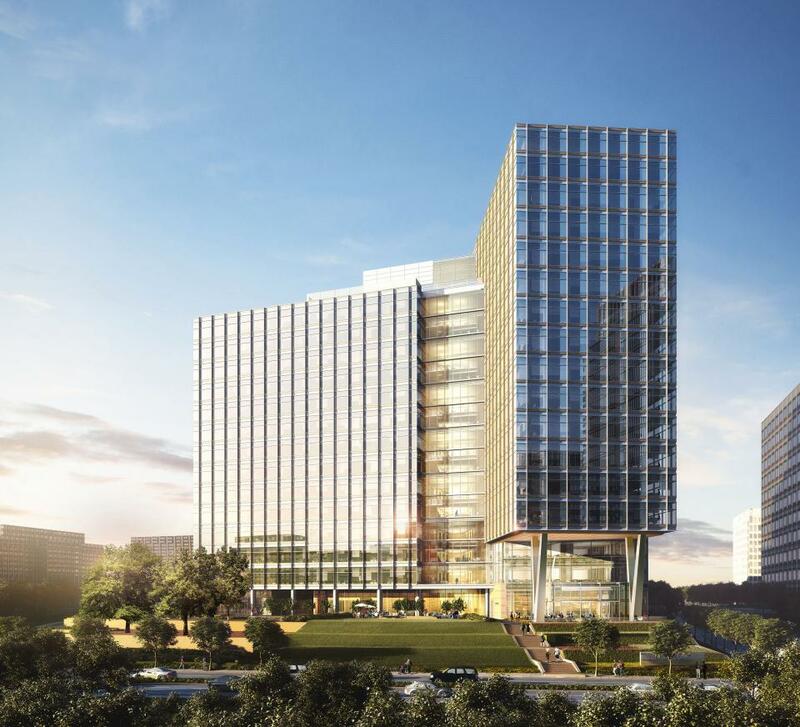 3001 Turtle Creek will be Pickard Chilton’s first building in Dallas, though the firm has completed numerous projects in Houston, including BG Group Place, 609 Main at Texas, and the ExxonMobil Energy Center. The firm is internationally recognized for its expertise in design of multi-tenant office developments worldwide as well as its deep understanding of the design of contemporary work environments and associated amenities. Highly acclaimed recent projects by Pickard Chilton include River Point in Chicago, the Northwestern Mutual Headquarters in Milwaukee, and the Devon Energy Center in Oklahoma City. As the building’s Design Architect, Pickard Chilton is working in collaboration with Dallas-based BOKA Powell as the Architect of Record and Thornton Tomasetti as the structural engineer. Pickard Chilton’s design for 3001 Turtle Creek will stand out as the jewel of the Turtle Creek neighborhood. The Class A office tower is divided into two wings, with one section cantilevering over a shaded outdoor area to help maximize tenant views of the Dallas skyline. The building has 10-foot floor-to-ceiling windows, collaborative workspaces, dynamic elevator atria and open stairway connections – all within an elegantly crafted curtainwall. The building’s 25,000-square-foot floorplates feature an offset core to maximize flexibility in accommodating a broad range of tenants. The high-performance and healthful workplace supports tenant innovation and collaboration while supporting their ability to attract, retain and engage employees. Furthermore, it allows for abundant natural light while offering breathtaking panoramic views of the park and the Dallas skyline. A one-acre park along Turtle Creek which connects the building with the popular Katy Trail is being designed by landscape architect Jim Burnett of The Office of James Burnett. Sophisticated common areas include a relaxing lobby with stone walls and wood ceilings anchored by a large, welcoming fireplace; a café for quick-serve breakfast and lunch; and a signature five-star restaurant offering a shaded outdoor patio nestled in the large oak trees on the site overlooking Turtle Creek. At ground level, a discrete circular drive offers vehicular access to 3001 Turtle Creek and parking. The building’s central location provides walkable access to Uptown and Turtle Creek’s numerous fine dining, entertainment, shopping and hotel offerings. Pickard Chilton is an international architectural practice noted for its expertise in the design of large, complex and often high-profile buildings including corporate headquarters, high-rise commercial office towers, hotels, and academic and health care facilities. The firm’s layered perspective informs all of the its work, presenting clients with a sophisticated, knowledge-based approach that emphasizes design vision, integrity, a focus on client objectives, and exceptional service. Headquartered in New Haven, Conn., the firm’s recent completed projects include: Devon Energy Center in Oklahoma City, Okla.; Eaton Center in Cleveland; Eighth Avenue Place in Calgary, Alberta; and 300 North LaSalle in Chicago. Current projects include the Northwestern Mutual Tower and Commons in Milwaukee, Wisconsin; Canal Place for Dominion Energy in Richmond, Va.; and a mixed-use project in Tampa, Fla.; as well commercial developments in Washington, D.C., Chicago, Calgary, Houston, and Kuala Lumpur, Malaysia. Visit www.pickardchilton.com for more information.